Here are some pics from the Battle of Williamsburg that I ran at Nashcon this year. I ran the game using "Johnny Reb 2" rules, which as many of you know are my favorite tactical ACW rules. The game is a relatively small affair with around two brigades per side and some artillery and officers. We had five players and it seemed everyone had a great time! The Rebs arrive on the field! The Reb's victory conditions were to inflict 40% casualties on the Yanks and to prevent them from taking the redoubt. The redoubt is defended by a 32# Howitzer and a large unit of VA militia. The Yanks pushed hard up the center of the table, which worked out as a great strategy! They did get caught in the abatis and chewed up by the 32# howitzer, but it allowed some other units to apply pressure to the redoubt and flank it. Charge! An isolated, brave rebel unit charged the Union line and suffered dearly! The Union advance towards the redoubt! This fire fight didn't turn out too well for the boys in blue. An overview of the table at the con before I started to place troops. 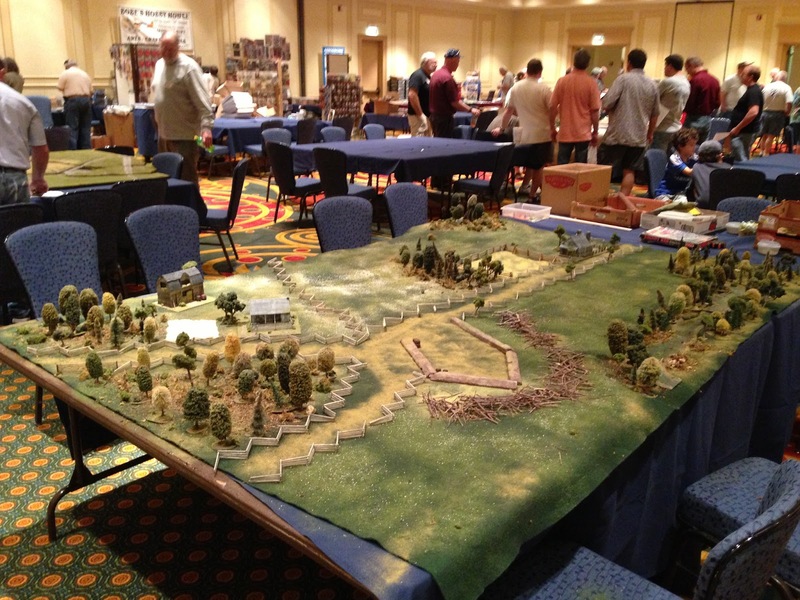 The Federals had to advance up the length of the table and capture the Confederate works. Thanks to my friend Chris W. for taking the pictures and John H. for a doing some photo-shopping. We have started another blog at the link below. I guess the best way to describe the new blog is to say that is a "club" effort with a few different friends and gamers writing articles. Let us know if you'd like to contribute! It branches out from Cigar Box Heroes by covering Fantasy and Sci-Fi as well. Don't worry, Cigar Box Heroes isn't going anywhere, but I'm just going to continue to stick to historical themes and items of personal interest. Check out the new blog below! Take care - Cory R.
The Photos,Minis and terrain look great! Lovely look game Cory, will check out the other blog! That's one great looking game! I like the texture of the table. Superb looking table and great to see all those troops on the table.